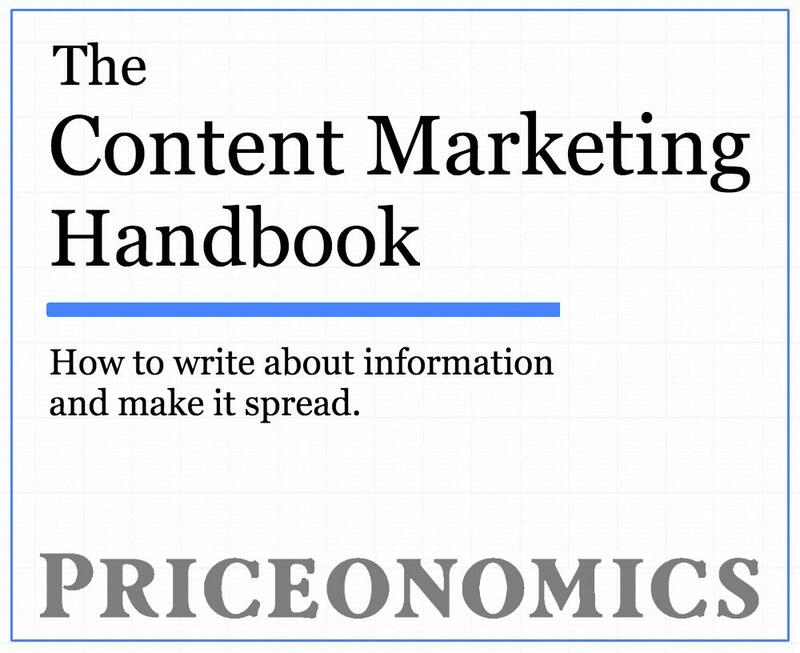 This post is adapted from the blog of Craft, a Priceonomics Content Platform customer. Want to learn more about the platform? Contact us here. In September 2018, Jerry Brown, Governor of California, signed a law that requires public companies with headquarters in California to have at least one woman on their Board of Directors by the end of 2019. Furthermore, by the end of 2021, if the company has five Directors, they must have at least two women on the Board and, if six or more Directors, they must have at least three women. Companies will be fined $100,000 the first year they do not comply with these requirements and $300,000 for each additional year. This is not a new or radical concept outside of the United States - in Europe, 24 countries have enacted similar quotas. Norway introduced quota legislation in 2006 that required public companies to have 40% female board representation by 2008. 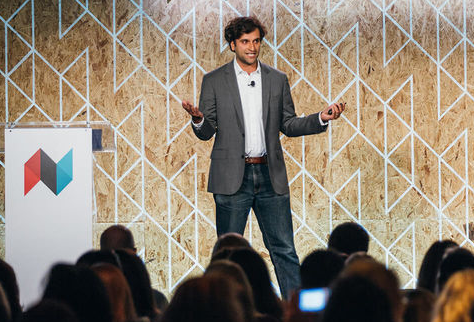 We took a look at 784 public companies that are headquartered in California to get a clearer picture of the potential impact of this legislation. This law still contains significant ambiguity and it is unclear if companies incorporated in other states (but with physical headquarters in California) will be mandated to these. For this analysis, we included public companies with principal executive offices in California that are either traded on an exchange (like NASDAQ, NYSE, etc.) or traded Over the Counter, which totaled 784 companies. Of these companies, 282 out of the 784 (36%) have no women on their Board and another 258 (33%) have only one. 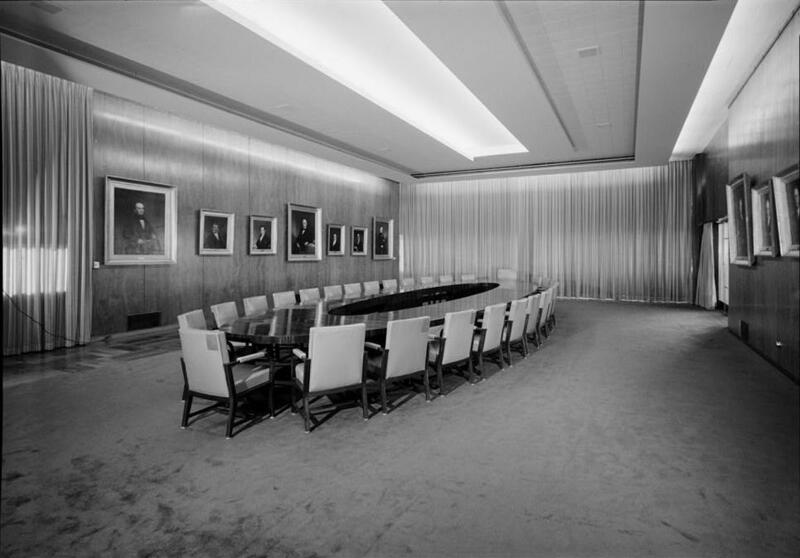 There were no companies with more than five women on their Board. The average board composition across the 784 companies is a seven seat Board - six men and one woman. If we look at the aggregate number of Board seats across the entire set of 784 companies, there are 5,703 total Board seats. 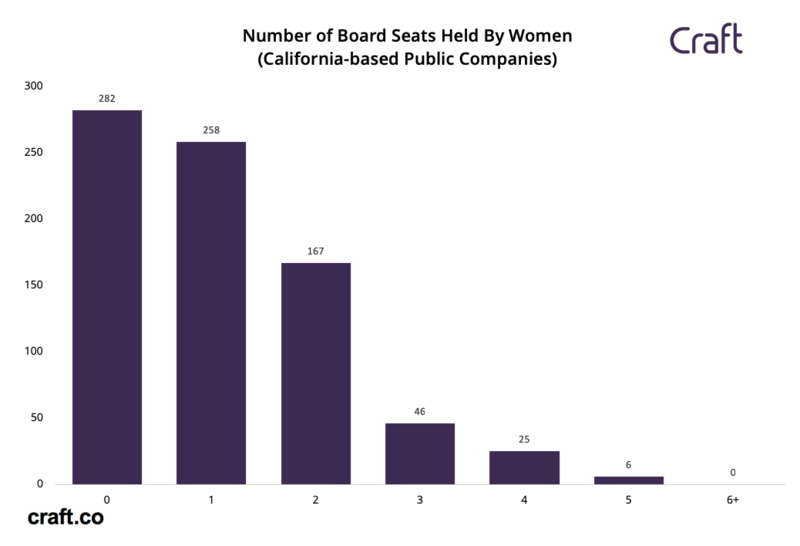 Men hold 4,847 of these Board seats and women hold 860 (roughly 15% representation of women across all Board seats). 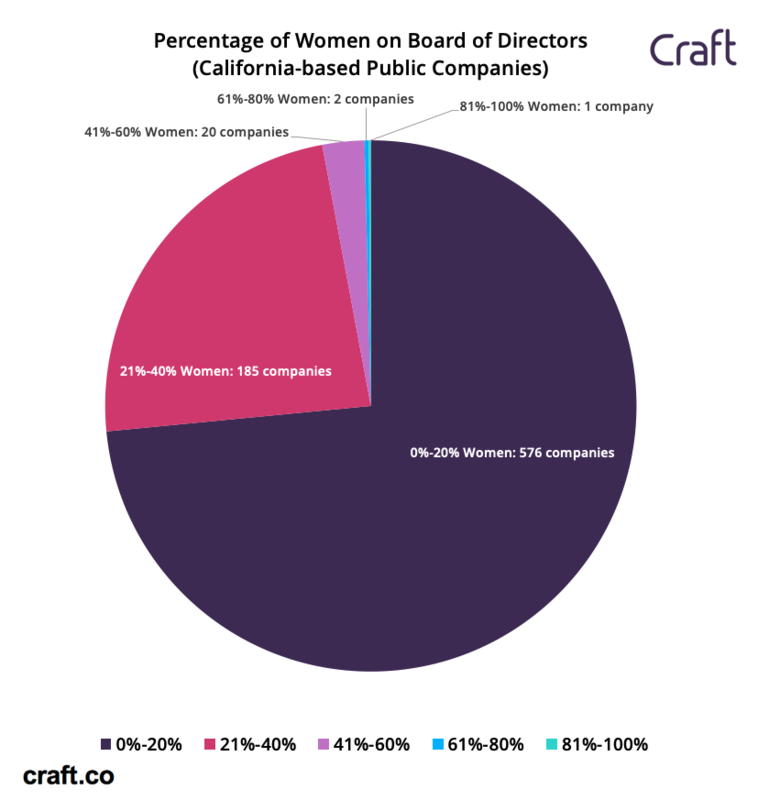 Out of the 784 public companies based in California, there are only four companies (0.5%) with more women than men on the Board - Motivating The Masses, Stitch Fix, Exponent, and Viveve. Motivating The Masses, a professional development and coaching service, has two Board seats, both of which are held by women. This represents the only all women Board in the entire group. Tutor Perini, a general contractor, has the highest revenue at $4.8 billion and the largest Board at twelve seats. 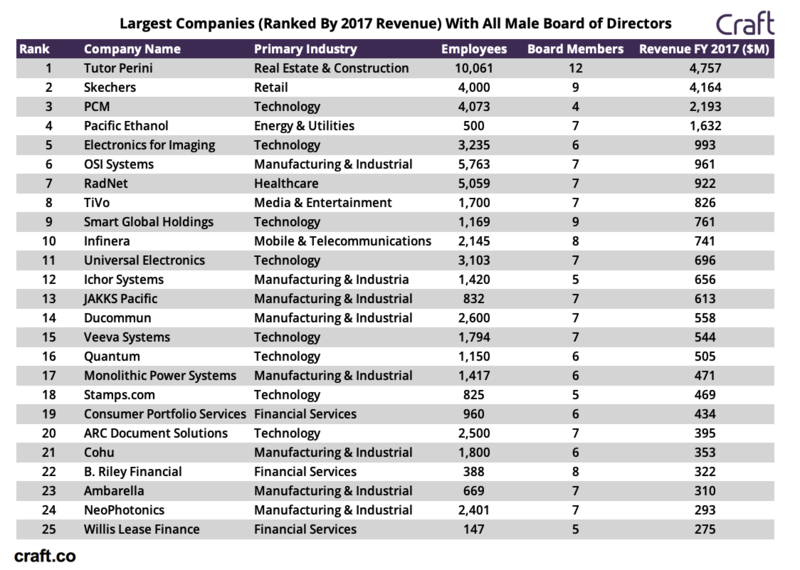 Manufacturing & Industrial companies (such as OSI Systems, Ichor Systems, JAKKS Pacific, and Ducommun), as well as Technology companies (such as PCM, Electronics for Imaging, Smart Global Holdings, and Veeva Systems), make up a significant portion of the largest companies with no women on their Board. While there are 282 companies (36%) that have no women on their Board, if we consider the requirements (at least 1 woman on all Boards, at least 2 women on Boards with 5 Directors, and at least 3 women on boards with 6+ Directors) by the end of 2021, there are 686 companies (87%) that are not compliant. If you are a woman looking for a position as a Board Member, let us know (hello@craft.co) - we can send you the list of companies that may be looking to fill some spots in the next few years.